Internal ground screw is standard The Cat. No. STI-3150 is an ideal weather resistant cover for surface mounted pull stations. It is made from UV stabilized polycarbonate. The cover is hinged and is supplied with strain relief. 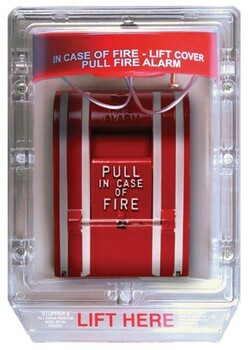 For protection of fire alarm pull stations in institutions, industrial, commercial and government facilities.